This week on the biocreativity blog I’m excited to feature my second illustrator in a row in the ECO Art + Science series. 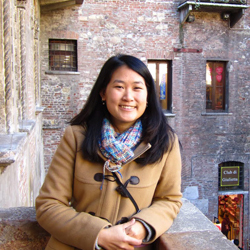 While I’m sure you’ll be able to see the parallels between the goals of illustrator Kevina Vulinec and this week’s featured artist-scientist Emily M. Eng, the two have come from different backgrounds in art and science. I connected with Emily’s background right away, as we both earned bachelors degrees in Biology and minors in Studio Art and Environmental Studies (though Emily added an impressive third minor in Religious Studies!). 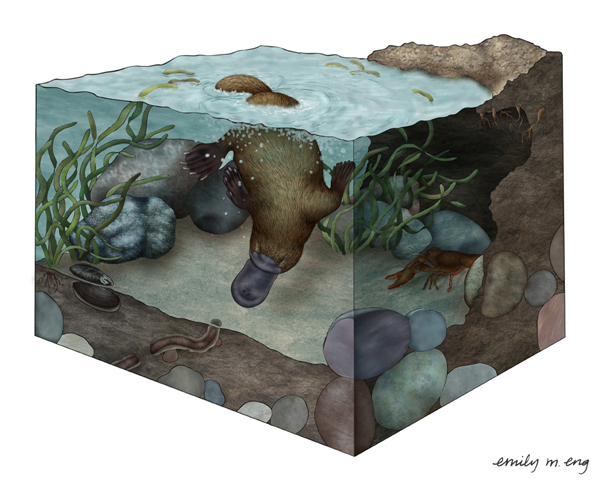 Emily then went on to earn her Science Illustration Graduate Certificate from California State University, Monterey Bay and has been dedicated to making science more accesible for people of all ages through her art ever since. [biocreativity] Hi Emily, I’m excited that I have the opportunity to feature two illustrators back-to-back! Can you begin by telling the biocreativity readers what type of work do you do? How would you describe your interests and profession? [EME] I’m a science illustrator and am lucky enough to be able to create art that helps explain science. I currently work at the California Academy of Sciences in San Francisco, CA for several of their curators along with freelancing on the side. As an illustrator I’m a generalist. 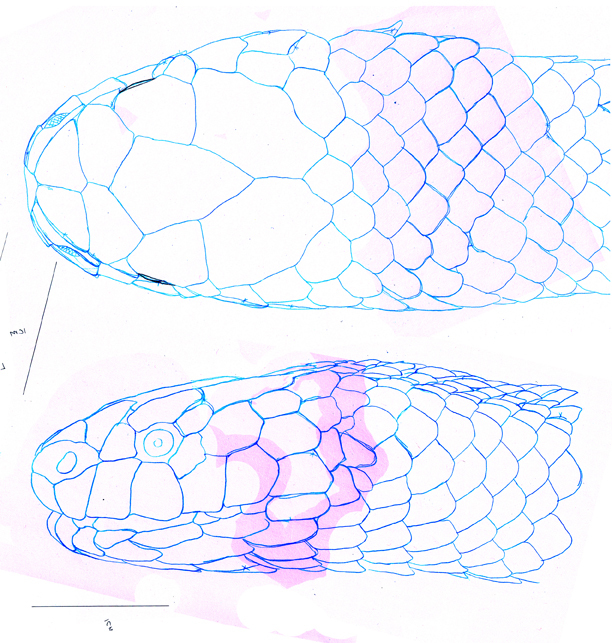 Some days I find myself drawing snake scales in the Herpetology department and other days I’ll be refining fish fin rays in the Ichthyology department. My goal as a science illustrator is help supplement science. I feel that science should be made approachable for everyone in a form that is easily comprehendible. That is why I became a science illustrator. Through art I have the universal tools to introduce scientific ideas, theories and current research to a much wider audience. [biocreativity] That sounds like an incredibly fun job! Where do you see yourself on the biocreativity spectrum? What is your primary training (art or science)? [EME] From the middle of the spectrum, I’d place myself slightly towards the art side. While I am creating artwork, it has more to do with the science behind the image than of pure artistic qualities. I’m trained in both science and art, with my B.S. in biology from Santa Clara University and my Masters certificate in science illustration from California State University, Monterey Bay. [biocreativity] The science illustration program at CSU Monterey Bay sounds incredible. What was it like working toward that degree? [EME] The Science Illustration Certificate Program (http://scienceillustration.org/) is an intensive year program. During the program I focused all of my time and energy on creating new illustrations. I thought I knew what it was like to work hard in undergrad but this was a whole new ballgame, and in the end it paid off. I improved beyond my wildest imagination as an artist, while learning the professional side of science illustration. Melibe nudibranch by Emily Eng. [biocreativity] Sounds like the ultimate art/science combination! What was the curriculum like? [EME] The curriculum started with art basics. Learning to draw what you see (field sketching), correct shading and values and proportions. We then began applying the basics in black and white medias, graphite, pen and ink, coquille, and scratchboard. Not until second quarter did we begin using colored media, watercolor, colored pencils, acrylic and gouache. Throughout the entire year we took a digital class to learn Illustrator and Photoshop. The assignments dictated different parameters like learning a specific medium or incorporating a special view. But the actual subject matter and what you choose to illustrate was up to the student. It was really fun as not only were you immersed in different styles from your classmates but also their different interests in subject matter. You definitely could see trends among students as I saw more spiders and skulls than I would have otherwise chosen. 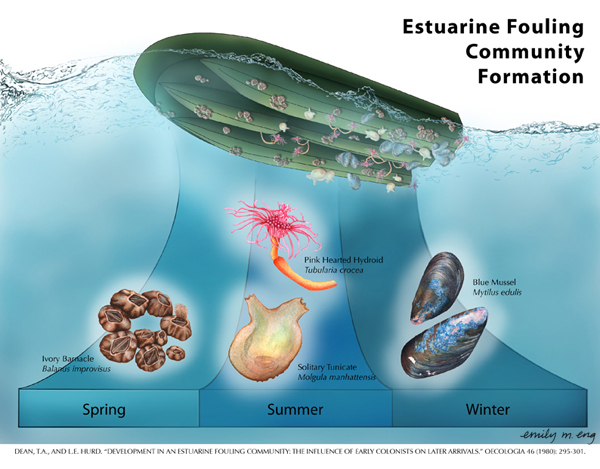 Esturarine Fouling Community Formation, illustration by Emily M. Eng. [biocreativity] What were your favorite and least favorite experiences in the program? [EME]One of my favorite experiences from the program was learning new medias. What I thought I knew about colored pencils flew out the window. While the colored pencil use didn’t change dramatically what I learned about the colored pencil substrate was revolutionary. Toned paper to drafting film can create starkly different results from the same colored pencil.This may sound weird but the hardest part of the program for me was drawing for the field sketching class. I’m not a big fan of drawing and sitting in one place just making sketches was a challenge for me. I much prefer the “finishing” of a piece, whether that is adding the color or adding in the shadows. American Lobster Fishery. Homarus americanus. Watercolor by Emily M. Eng. [biocreativity] All of that probably leaves you well-prepared for my next question. Emily, how do you view the interaction of arts and sciences? What’s your take on how these disciplines interact? [EME] I feel that art and science are firmly rooted together. In order to create a realistic representation of an organism you have to know the science behind it. For example if I am drawing a kelp crab in its natural habitat I can’t just plop the crab anywhere in the ocean, I need to know the crab’s natural history. Does the crab live in the benthic zone or the pelagic zone? Are kelp crabs solitary or social organisms? Are they nocturnal or diurnal? Even the coloration of an organism is dependent on scientific understanding (coloration often varies with diet, environment and seasonality). Therefore, to have a successful and accurate scientific illustration you not only need to be able to draw but also understand the underlying science. 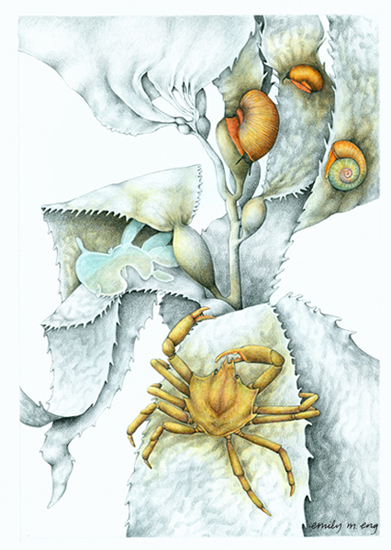 Giant Kelp Home (Macrocystis pyrifera), coquille and watercolor by Emily M. Eng. [biocreativity] Described like a true natural historian. Can you please describe your art + science work in more detail for the biocreativity readers? [EME] At the California Academy of Sciences, my work varies with each curator and the goals of their research. 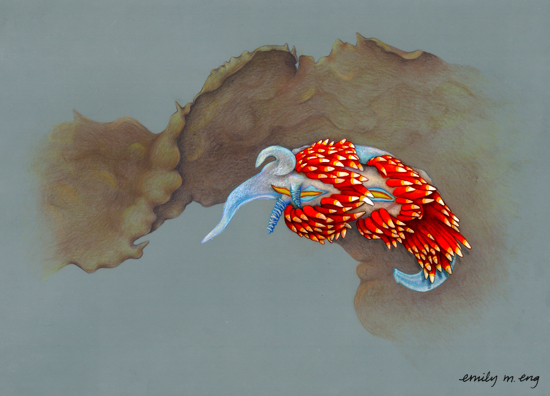 For Dr. Terry Gosliner, I help illustrate new species of sea slugs and nudibranchs discovered during his dive trips. I focus on morphology for comparison with other known species. I illustrate these in pen and ink for journal publications. Dr. Alan Leviton is writing an identification guide on the deadly and venomous snakes of the Philippines. 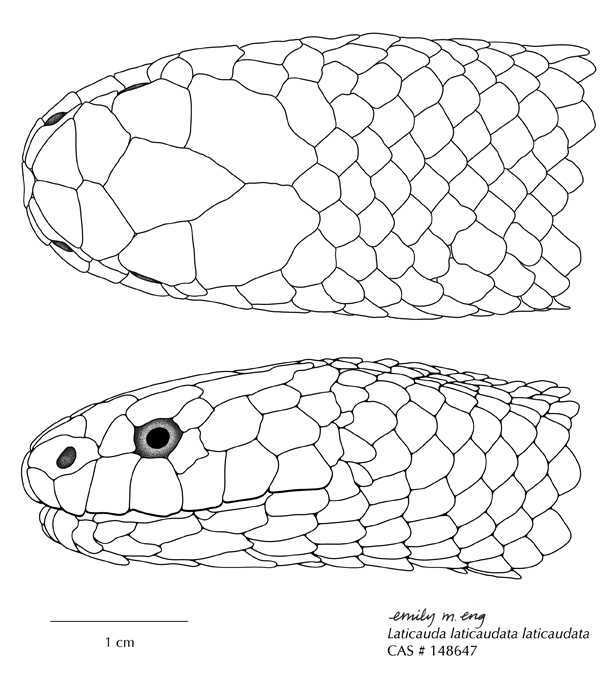 I help illustrate the scale patterns on the heads of different snake species, some of which have never been illustrated before. To keep the snake images uniform I create them digitally using Adobe Illustrator and Photoshop. Finally my work with Dr. Tomio Iwamoto adds to his identification key highlighting the differences between species within the Coelorinchus genus. These I do in traditional pen and ink and stipple to indicate the presence or absence of scales. Coelorinchus divergens by Emily M. Eng. [biocreativity] I guess I hadn’t thought much about scientific illustrators using digital workspaces to help create their art (even though the software is named illustrator!). 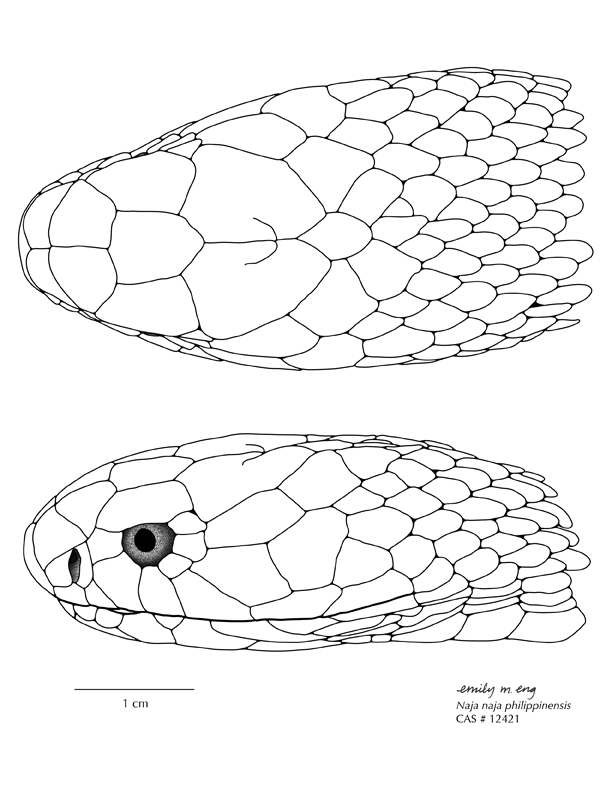 How does that process work for – let’s say – illustrating a venomous snake head? [EME] I start off looking at the snake specimen under a microscope. I position the snake as uniformly as possible ensuring that the head isn’t leaning to one side or another. This is somewhat tricky as all of the specimens are preserved in ethanol filled jars and their heads tend to get squished. 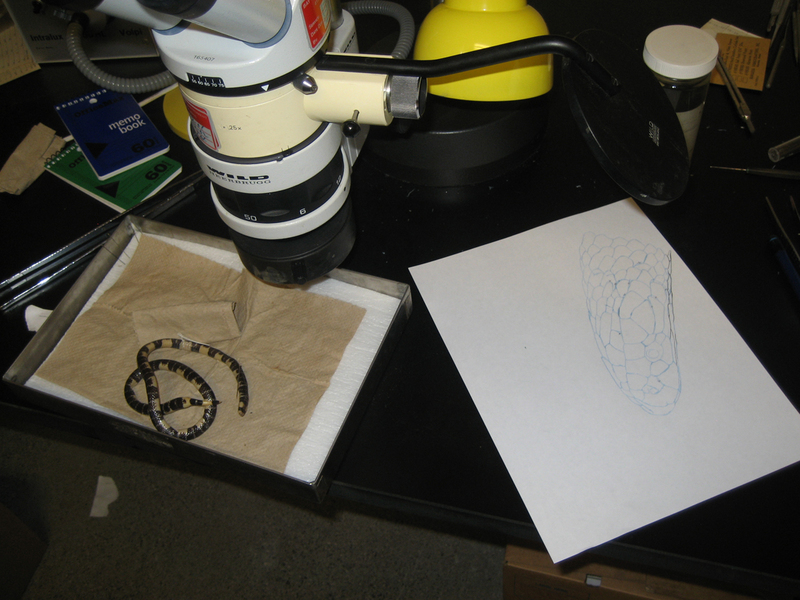 Then using a camera lucida (drawing tube attached to a microscope that allows the viewer to not only see the specimen but also their pencil/paper) I trace the specimen. Emily makes use of a camera lucida in her snake illustrations. Once I have the sketch done I scan it into the computer and compile the dorsal and lateral views. I align the views in Photoshop to make sure that their eyes, nostrils, and scales line up when stacked vertically. Then I take the combined image into Illustrator and digitally trace over the lines. After this preliminary drawing is done I print it out and compare/ recheck it to the specimen. I look at several specimens to make sure that the scales I’ve drawn are descriptive of all of them and not of the individual that I traced. I make the necessary changes in blue pencil and then scan the changes into the computer. I then adjust the Illustrator line work to reflect the changes. After the lines are completed I export everything into Photoshop and add the finishing details like snodgrass (divots of shadow) and eye shading. For me all of my work starts out as a traditional drawing/sketch which is then converted into a digital image. I consider something completely digitally made if all you see in the final version are the digital marks. I do enjoy digital coloring as the textures and brushes in Photoshop are just fun. And who doesn’t like an Undo button? If I move between digital and traditional medias a lot I catch myself thinking “Command Z” in my head even when I’m painting a watercolor. I prefer traditional medias as there is just something nice about being able to hold your finished piece at the end. But depending on the goal of the illustration and time constraints digital often works best. [biocreativity] Emily, what inspired you to become a science illustrator? [EME] My inspiration to become a science illustrator sprung from my realization that my scientific knowledge and understanding relied on the information from illustrations. I noticed that I spent more time flipping through my biology textbooks to look at every diagram and illustration than I did actually reading the text. Without the illustrations presented in textbooks, I still would be lost to the anatomy of a cell or how proteins are folded. But who truly made me pursue illustration as a career is the artist John D. Dawson. I fell in love with his EPA poster “Estuaries: Scenes of Transition.” In this poster Dawson arranges organisms in different estuary environments around the United States. He does this with amazing artistic detail, all the while ensuring that all the organisms are scientifically correct and represented accurately in their specific estuarine environment. Once I saw his blending of artistic beauty and scientific information, it sealed my fate in becoming a science illustrator. 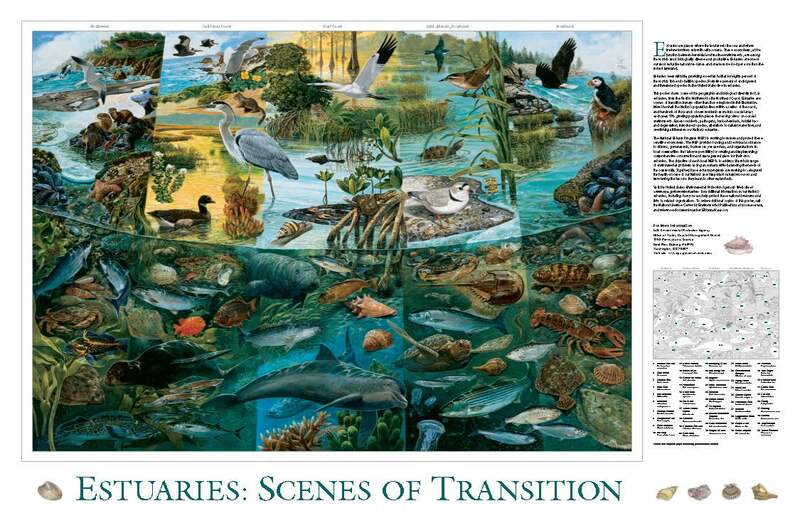 Estuaries: Scenes of Transition by John D. Dawson. Created for the U.S. Environmental Protection Agency. Poster available free from http://water.epa.gov/learn/kids/estuaries/poster.cfm. [EME] Science illustration is not a dead occupation and it can’t be replaced with photographs. Illustration still holds an important role in scientific understanding. Florida Gopher Frog. Rana areolata aesopus. Photoshop by Emily M. Eng. [biocreativity] Very well said! 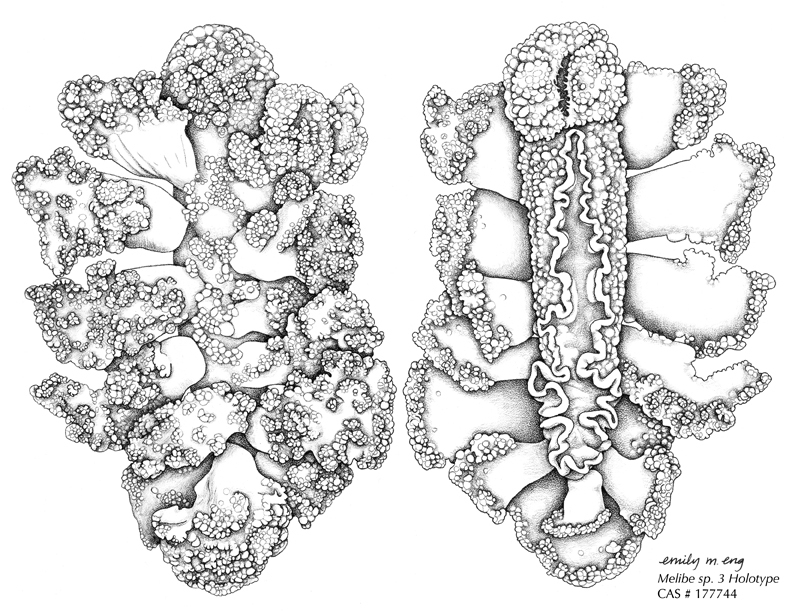 I think if Ernst Haeckel were alive today he’d agree with you (and be relieved that you’ve found a way to balance art + science in a way that he struggled with early in his career). Emily, what is the most common question or comment you get about your work? [EME] The most common question/comment I get is, “why don’t you just take a picture?” Science illustration provides so much more than photography. An illustrator can highlight parts of an organism that a camera may not capture. We can also take the viewer into special views where cameras cannot go (example: layers of the earth, inside a volcano, or back in time to prehistoric eras) and also create idealized environments (all organisms within a food web or multiple stages within a life cycle). Photographs are wonderful and remain important in science but it cannot replace the illustrator. Platypus. Photoshop by Emily M. Eng. 1. Dr. Terry Gosliner- Nudibranchs: To prove that an organism is a new species you need to be able to compare it to know species. In order to do that the specimen needs to be displayed in a way that you can see all of the body parts (morphology). As invertebrates, nudibranchs tend to fold and bend while alive and with so many certa (appendages) it becomes confusing which body part is which. I am able to illustrate the idealized organism. I can average several individuals and repair broken parts along with rotating the body so that all important features are visible. 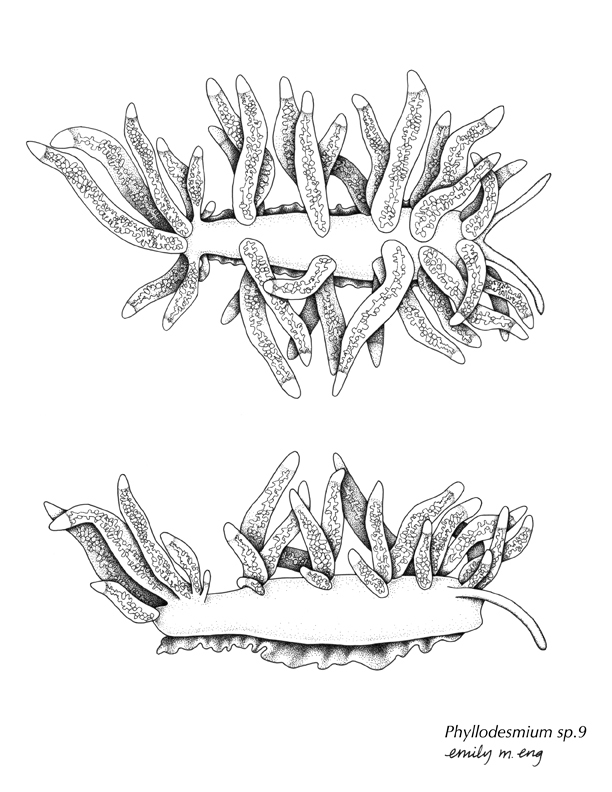 Phyllodesmium nudibranch. Pen and ink drawing by Emily M. Eng. 2. Dr. Alan Leviton- Snakes: I focus on the snake scale patterns/shape, to help identify the species. While you can take a photograph of the specimen, scales on dark snakes/ very pale snakes are tough to see. By drawing out the scale patterns I can remove shadows and coloration that would be confusing in a photograph. Also since the little guys are round, not all of the scales are in focus. As an illustrator I can make sure that all the scales clearly defined and are in focus making them easy for identification. 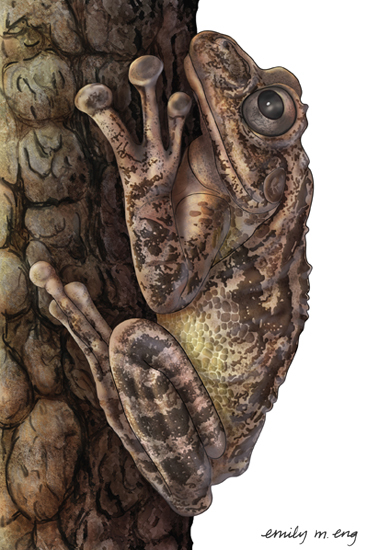 Naja naja philipinensis, drawing by Emily M. Eng. 3. Dr. Tomio Iwamoto- Fish: I draw fish for species comparison, specifically I indicate scale presence versus bald patches (a differentiating identification feature). The scales are tiny in places, overlap and translucent, making them extremely difficult to photograph. In fact, even I have a tough time determining if there is a scale unless I actually touch the questionable area. Also scales have a tendency to fall off the specimen giving false areas of bald spots. By illustrating these fish I am able to fill in the scales if they have fallen off, emphasize important scales/ features, and average multiple specimens to create an idealized organism. 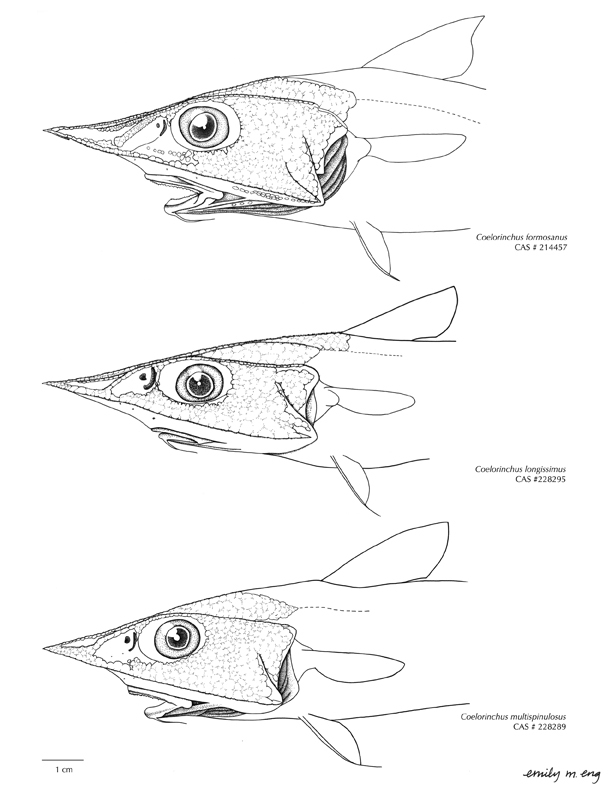 Lateral view of three species of Coelorinchus by Emily M. Eng. [biocreativity] Emily, what’s next for you in art + science? Where do you see your work going, or what would you like to do next? [EME] My next plan as a science illustrator is very similar to a scientist, I want to be published. I hope to one day have an illustration in Science Magazine, National Geographic and Scientific American. There I hope my illustrations can help others better understand science or inspire them to investigate further. [biocreativity] Do you have a website, blog, facebook page, twitter account, etc. that you’d like the biocreativity readers to know about? [biocreativity] It’s a beautiful website! Emily, thanks so much for sharing your talents with us on the biocreativity blog. You do amazing work! Stay tuned for more ECO Art + Science interviews each Thursday right here at www.biocreativity.wordpress.com! If you or someone you know should be featured in this series, please send an email to biocreativity@yahoo.com. 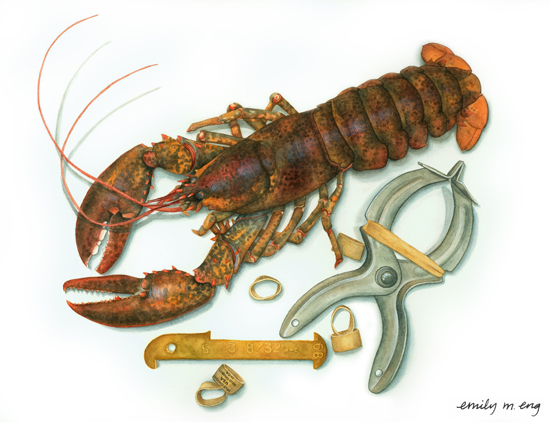 This entry was posted in animals, biology, contemporary, illustration and tagged drawing, fish, kelp, lobster, nudibranchs, painting, scientific illustration, snakes by h. gillespie. Bookmark the permalink. Hi! your work is awesome and It would be great to share ideas. Thanks so much Esteban. Please email me as I’d love to work together on something, em@emilymeng.com. Very nice work Emily, do gopher frogs have toepads like tree frogs and are trees their habitat? I always thought they lived in burrows (although they are nocturnally active) and had straight toes. Inquiring minds want to know. Keep up the good work Hayley!